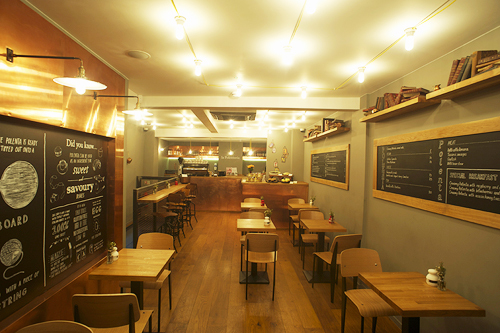 La Polenteria is a brand-new addition to the eclectic mix of establishments on Old Compton Street in London's Soho. It's not very big, but the small size adds to the intimate and homely feel of the restaurant. What also makes this new eatery stand out from its many neighbours is that all dishes served are gluten-free. Many of the options are also vegetarian and some are even vegan, so there is plenty of choice on the menu for people with all sorts of dietary requirements. The main ingredient in most of the dishes served is polenta, which originates from Italy and is made from cornmeal boiled into a porridge which is then baked, fried or grilled. As polenta consists of just cornmeal with water or milk it is a great substitute to bread and pasta for those who are on a gluten-free diet. When we arrived at the restaurant we were met by the friendly waiting staff as well as owner and manager Cristina Sparcaci, who had made the special effort to welcome us personally. The lovely welcome and excellent service continued throughout the evening, making our visit to the restaurant a very pleasant experience. While there were no appetisers on the menu when we visited (a new menu will be rolled out soon) we were treated to a taste of what is to come as we were the first to try the appetising starter shown above. 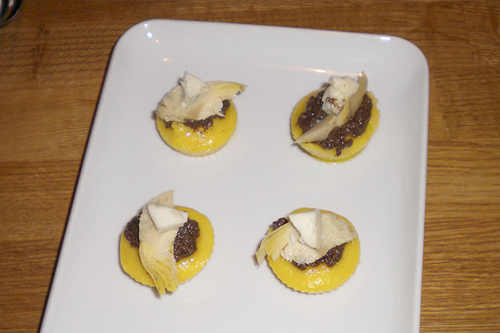 These little bites don't have a name yet but we can say that they are made from a delicious combination of polenta, olive spread, artichokes and cheese, and they provided us with a perfect savoury and slightly tangy taste of what was to come. 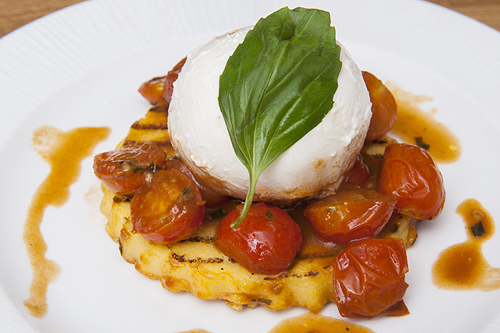 For the main course there's the choice from one of the traditional polenta dishes as well as sandwiches and salads. We of course both opted for polenta, after all, when in Rome. My friend chose the vegetarian Burrata with fresh chopped cherry tomatoes. The burrata cheese placed so elegantly on top is made from mozzarella and cream and despite being soft in the middle it held its shape well, which made for a stunning picture on the plate. 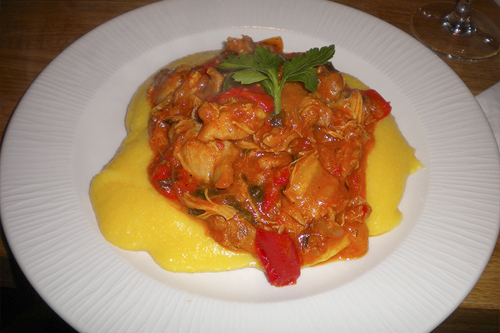 Even though I was very tempted to pick the same main as my friend, it looked so very pretty after all, for a full picture of the diversity of polenta I ordered the Pollo alla Romana instead. The initial taste sensation was that of a good stew on top of a pudding. This was magnified by the fact that in the Netherlands we have a very similar sweet dessert that starts off the same as polenta and so the first few bites were reminiscent of that, except savoury. Once I was able to get past the strangeness of a savoury pudding I thoroughly enjoyed my first proper introduction to polenta. The plates served aren't excessively full yet the meal was pleasantly filling. Eating the homely and warming dish was very satisfying and the denseness of the texture was broken up nicely by small sips from the Prosecco we had ordered with our meal. 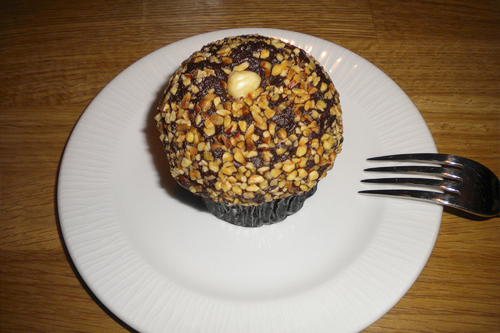 Despite the filling qualities of the mains we were easily tempted by the desserts menu and in particular the Ferrero Rocher cupcake which sounded absolutely divine on paper. I'd been craving chocolate all day so the treat had a lot to live up to and thankfully it didn't only live up to my expectations, but even exceeded them. The dense cake was complimented very well by the super sweet and rich icing on the top and the crunchiness of the nuts added a lovely bit of texture to the dish as a whole. This delectable and intense chocolate dessert alone is worth visiting the restaurant for as an after theatre treat. Though if you can spare the time for a proper sit down meal we recommend the polenta mains as well, especially if you haven't had the opportunity yet to try this Italian dish as once you've had a bite you will definitely want more. La Polenteria, 64 Old Compton Street, London W1D 4UQ.